The need to process images in batch mode is something that we all run into at a certain point and when we do we realize that there are not so many quality Mac apps out there that can do the job the way we want to. In this article we will talk about five great apps for batch image processing that you should always have on your Mac. Digital images are everywhere these days and most of us have to deal with lots of them on a daily basis. It doesn’t matter if you are a professional photographer, the owner of a photography blog, a real estate agent or just a simple Mac user, there will definitely be a moment when you will have to resize a large number of images and you will realize that you cannot do this one image at a time so you will look for an app that does this in batch mode. Instead of wasting a lot of time and money trying to find an adequate app that can resize images in batch mode, you could give ImageSize a try and you will be amazed with the results. ImageSize offers a wide range of features which include resizing images to a set of dimensions that can be defined in either pixels or percents, resizing images by fixed width, fixed height or fixed width and height, preview of the dimensions of the original and output images and the option of preserving the EXIF information and creation date of the original images. 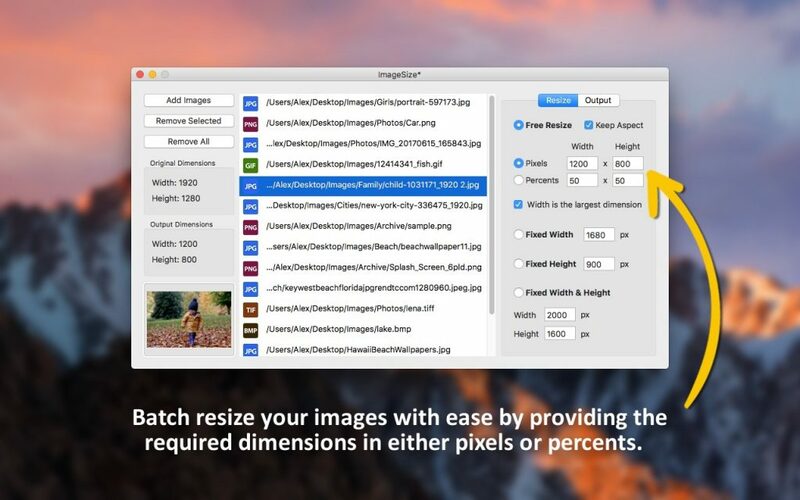 All these features combined with a very attractive price tag make ImageSize the perfect app for resizing images in bulk on a Mac. If you are a website administrator then you probably know how important it is for your website to have a very high loading speed. These days websites are filled with hundreds of images that can increase loading time if they are not optimized. 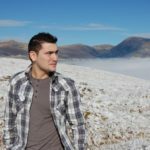 The first step that you must take towards optimizing your images is converting them to a format that offers the perfect balance between quality and file size. For example, if you need to display simple photos without text or transparency then a lossy compression format like JPEG is the best choice, otherwise you should use a lossless compression format like GIF or PNG. After you have made up your mind about what image format to use you will probably need an app that can batch convert all your website images to the desired format. 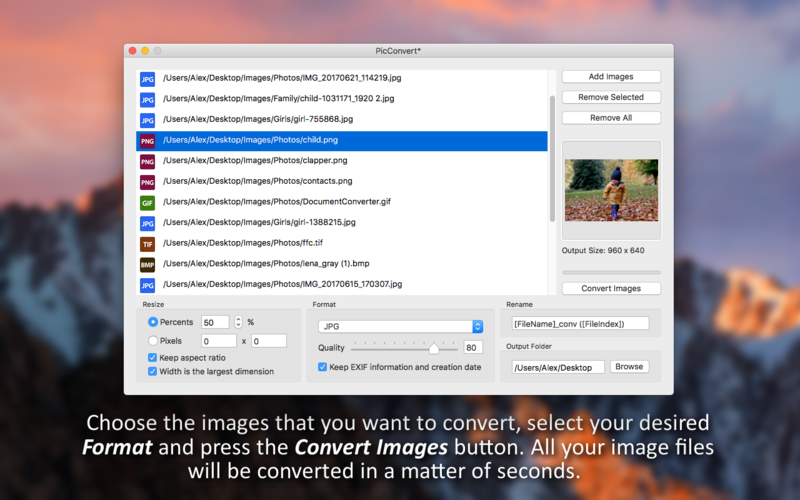 The best Mac app for this job is PicConvert, a powerful batch image converter that offers a wide array of formats including JPG, JPEG, JPE, JP2, JPX, PNG, TIFF, TIF, GIF or BMP. 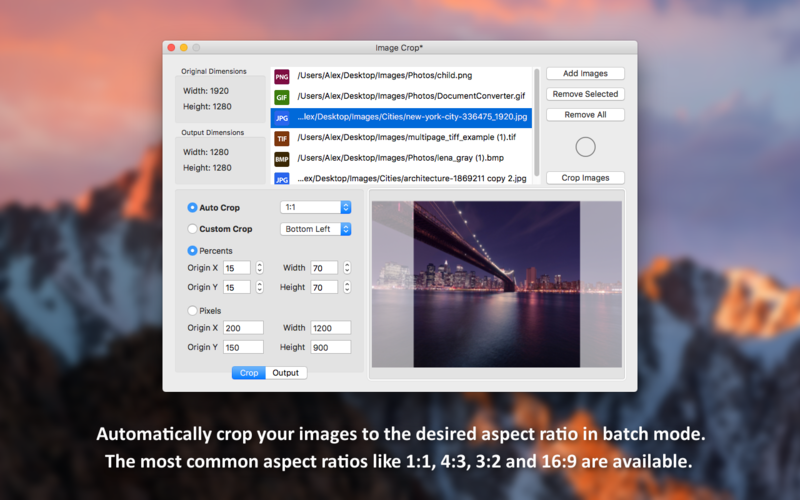 PicConvert also offers you the options of resizing and renaming your images in batch mode which can prove very useful and make this app a must have for any Mac user that deals with a lot of images on a daily basis. How many times have you tried to post a set of photos online and you realized that they have the wrong aspect ratio and they don’t fit in well with the overall design of the website? Probably a lot. That is why, in moments like that, a Mac app that can batch crop photos can come in handy. Image Crop is the perfect app for the job since it offers a lot of features including Auto Crop to a standard aspect ratio, Custom Crop using Pixels or Percents to define the crop rectangle and live preview of the cropped images. There are a lot of apps out there that can crop images one at a time quite well but there are very few that do this in batch mode. Image Crop is a very efficient app that works perfectly for cropping individual images one at a time as well as cropping thousands of images in batch mode. So get Image Crop today and you will never have to worry about cropping images again. GIFs are very useful for displaying small, low-resolution animations online and their main advantage is that they are widely supported. But how can you create an animated GIF from scratch? Well, you would need an app that can convert videos and images to animated GIFs. 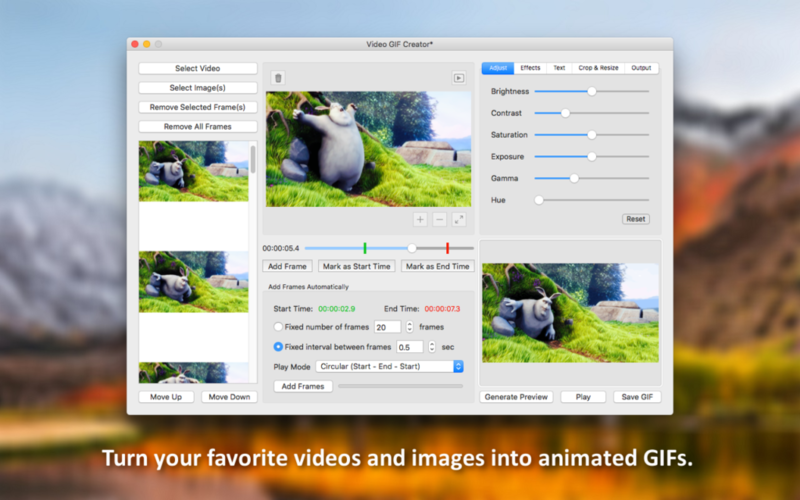 Video GIF Creator is a Mac app that does exactly that and it does it in three simple steps. Just select the images or video that you want to use as the source of your GIF, manually or automatically add the desired frames to your GIF, define the frame delay, loop count and number of colors of your GIF and you are ready to go. All you have to do now is generate your new animated GIF and see the results. You can also adjust, apply artistic effects, add text, crop or resize each frame before adding it to your GIF. All these various features make Video GIF Creator the best Mac app for creating animated GIFs. When you go on a vacation you usually take a lot of pictures and when you get back home you want to send all those great photos to your friends and family. But how can you do that in a way that is optimal? The best way to do this is to create a PDF photo album which you can then easily send via email to all your loved ones. 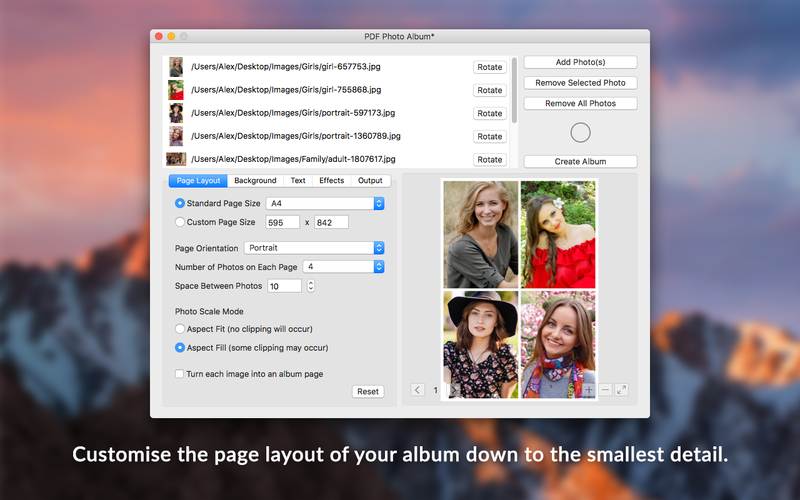 PDF Photo Album is a powerful Mac app that enables you to batch convert images to PDF with ease. Just select the desired images and press the Create Album button and you are done. All your images will be converted to a PDF album with the press of a button. You can also customize the layout, background and text of your album. So purchase PDF Photo Album today and start creating some stunning PDF albums.